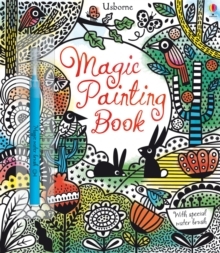 A magic painting book like you've never seen before, with wonderful vibrant colours. Includes 16 beautiful, full-page black and white illustrations, from butterflies and birds to a grand castle and a jungle of tigers, which are transformed into a rainbow of colours when children carefully paint water onto the pictures. There's a flap to place behind the painting to stop paint seeping through to the next page and ensure perfect results.